So I am on vacation right now. I decided to run some errands in my hometown. Check the po box and stuff. 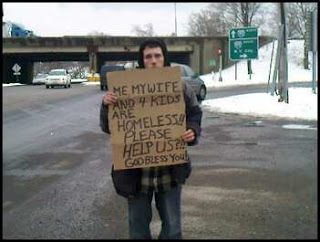 Off of the highway overpass I saw a guy standing on the sidewalk with a cardboard sign in his hand. I got off of the highway and pulled in to the Dunkin Donuts where he was at. I read the sign. Him and his wife and 4 kids were homeless and he was asking for any help. . . . so I went over and talked to him and introduced myself. He was happy just for the fact that I came and talked to him. I talked to him about his story and to make sure he wasnt some crackhead. He was legit. He was telling me how ashamed he was standing there but he had to make money to provide and keep them in a cheesy nasty hotel room to stay warm. Wonderful story and a great act of kindness. I can appreciate the kindness. It appears the old adage is correct..."no good deed goes unpunished". People need to understand that these are the types of things we as a people do for our own. Of course, the news media will always focus on the negative. The fight at a rally (which is usually caused by the "other side") etc... What they don't know about is the things we do inside. Stuff for our POW's, for our families that have hit on hard times or who have health issues, or as in your story, the RAOW we do on a daily basis. We are NOT monsters as the media would make us out to be. These are the moments we as Whites need to focus on and continue. People need to use this RAOW as an example and continue along these types of actions. Than you for sharing this story and for your dedication to our race. Do not attack other races, but also do not waste resources to them. Resources we whites produces should be used to uphold only our own. That's called racism and it's perfectly natural and moral to discriminate for ones own kind. White people should already have stopped supporting multiracial society and corporations. Don't become total hermit but live detached from the system and especially it's imagery. We are not politcal parties, ideologies or fancy logos on baseball caps. We're people. No racism leads logically to destruction of ones race - kinda like what's happening now in white countries. Tolerance is ethnic suicide.